Being a left-handed creative prodigy (just kidding), it’s quite difficult to find a suitable fountain pen which wouldn’t scratch or dig up fibres from paper when writing. 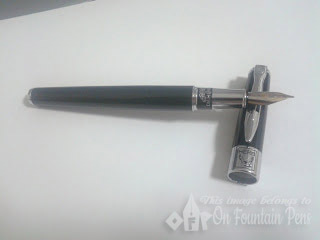 Or let’s put it this way: I’m currently not able nor willing to spend a diamond on a good fountain pen, so it’s not very easy to get the best of both worlds in terms of price and “left-hand-ability” for a fountain pen. But this pen costs only 98 RMB (approx. 18-19 SGD) and writes like an angel for me. The pen is about 13.5cm capped and 15.5cm posted. When uncapped it rests well between my thumb and index finger and to me it’s quite well-balanced in terms of weight. The body is lacquered black and there is a picture of a hawk on the clip side of the pen cap. On the other side of the cap it simply says “1382”. The Hero 1382’s nib is a 22K iridium two-tone point which writes with a medium line. It makes use of the Hero converter to store the ink. I filled the converter with Lamy Blue ink and tried writing with it. The ink flow was smooth and the nib does not resist much to my left-handed pushing while writing. The line that emerged was a rich blue tone, very much unlike the lighter shade of blue produced by my fine-tipped Pilot. Honestly I was surprised that this pen is that cheap. Moreover it comes in a solid-looking black box with thick lining inside to protect the pen and a piece of ribbon to hold the pen still in the box. 98 RMB is definitely worth paying for such a pen. I've been rather busy and still ill, so I'm going to just put up a short post!